Weston church seems to try to keep itself secret. It's barely visible from any through road, and, when approached by foot from the south east or south west, doesn't look particularly promising. The nave is unattractively cement-rendered and all the window tracery has been renewed. 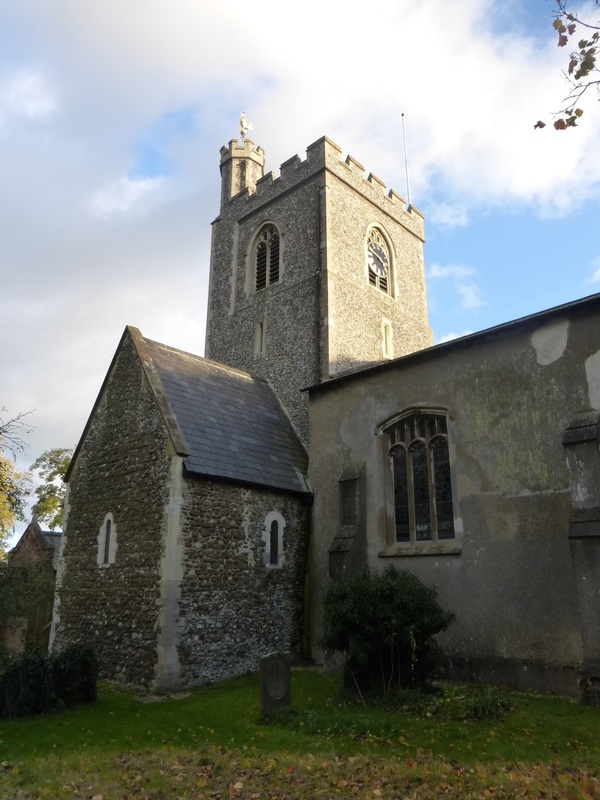 The general impression is of a typical late medieval building, typically heavily restored in the later 19th century. Only the Neo-Norman redbrick chancel is out of the ordinary. Push the door open, however, and it's immediately clear that this impression is not the whole truth, for to your right is an exciting vista through four Russian doll-like arches, space unfolding from space in a manner rarely found in smaller churches. The first and nearest is that of the Perpendicular south aisle arcade, of the 15th century and with stubby columns, but through this is visible a plain Norman chancel arch, and through this another Norman arch leading into a north transept, and through this can be glimpsed the outline of yet another Norman arch. 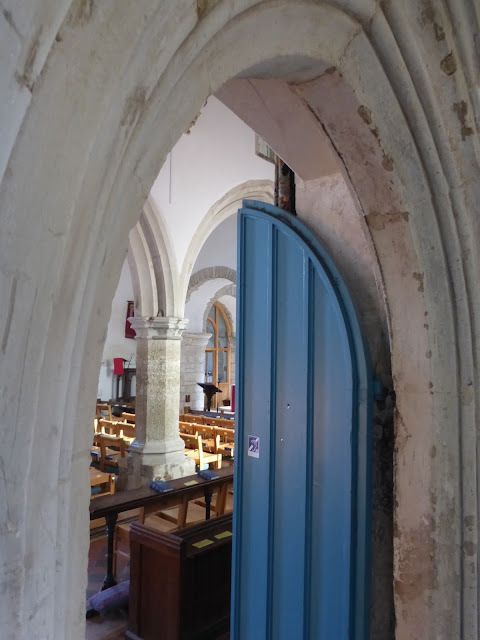 If you step back into the porch, the prospect acquires one more arch (of the 15th century), the south doorway, bringing the total to five, though the utilitarian blue door obstructs the view. 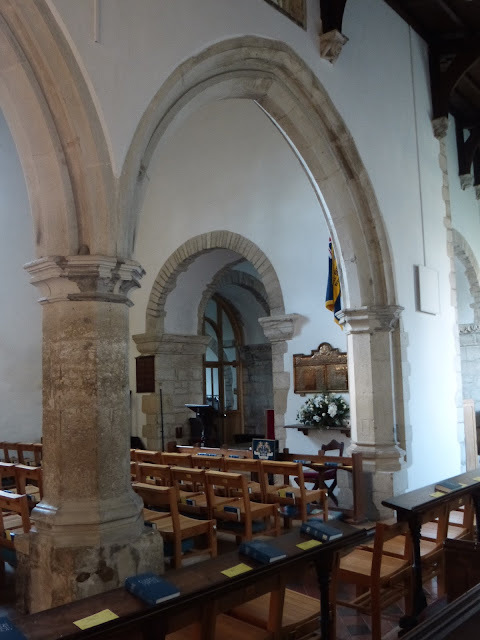 Walk into the nave, and it becomes clear that you're looking at a complete Norman crossing. 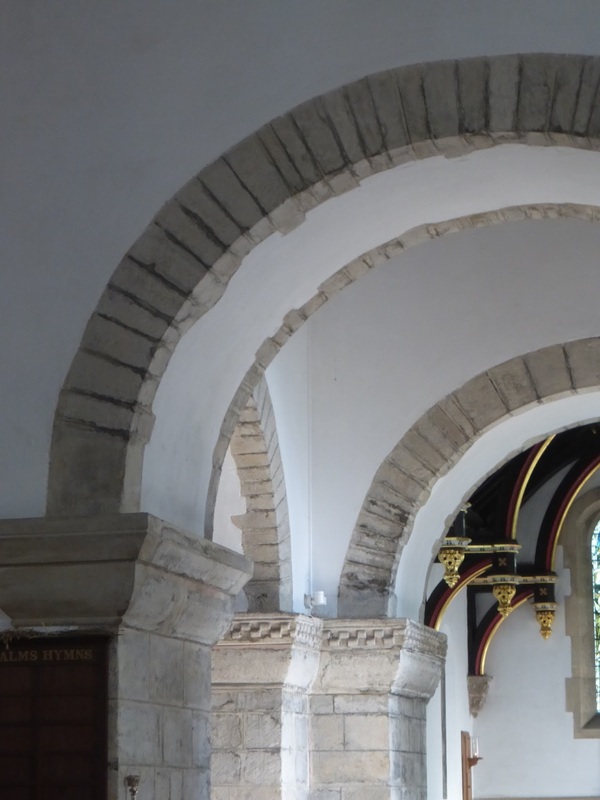 * The arches are so plain and austere - not even a chamfer - that it's tempting to call them early Norman. The capitals of the western arch are also unadorned, but those to the east have been decorated (probably to honour the sacredness of the chancel). The southern capital of the east arch has simple semi-circular scallops. While the adjacent eastern capital of the south arch is similar but more elaborate, with the plain flat semi-circles becoming crescents, alternately either whole, like horseshoes, or with incised channels so that they look like beads on a necklace. Note how, in the photo above, on the right three crescents overlap, which they do nowhere else. Why is this? Did the mason want equal numbers of plain and beaded crescents, and found that he'd miscalculated as he reached the end (assuming he worked left to right), and so squeezed an extra one in? We can only speculate. 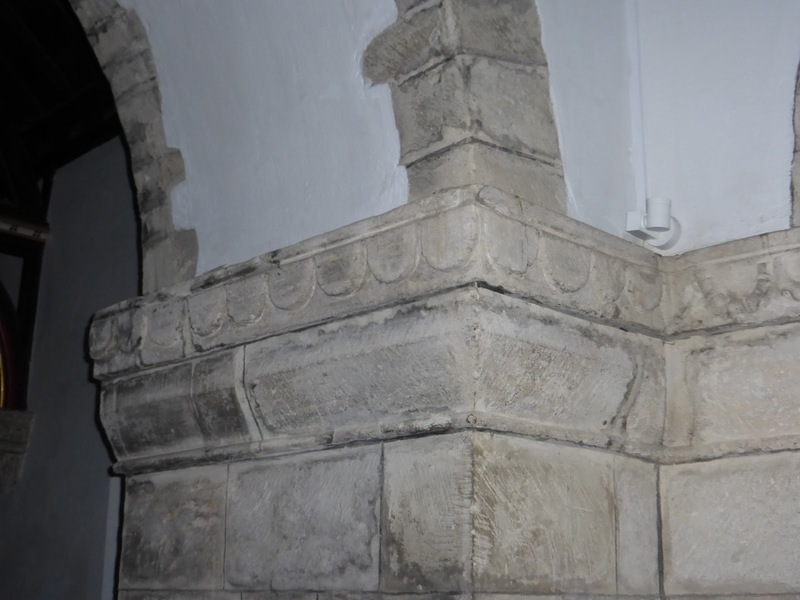 The capitals on the north are decorated with typically Norman billet moulding, as this style of short sections of demi-cylinders, like a cable that's been thoroughly diced, is called. The Norman north transept survives more or less intact, though it's now the vestry. 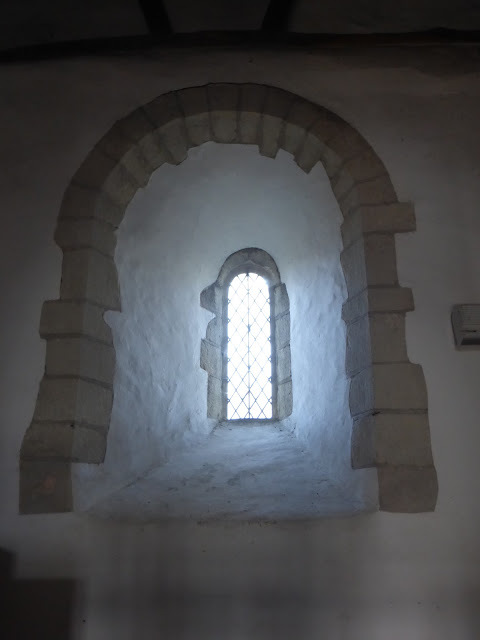 The north and west walls each have a typically tiny window; possibly originally they would have been unglazed (though probably shuttered), and their small size would have helped keep out the weather. 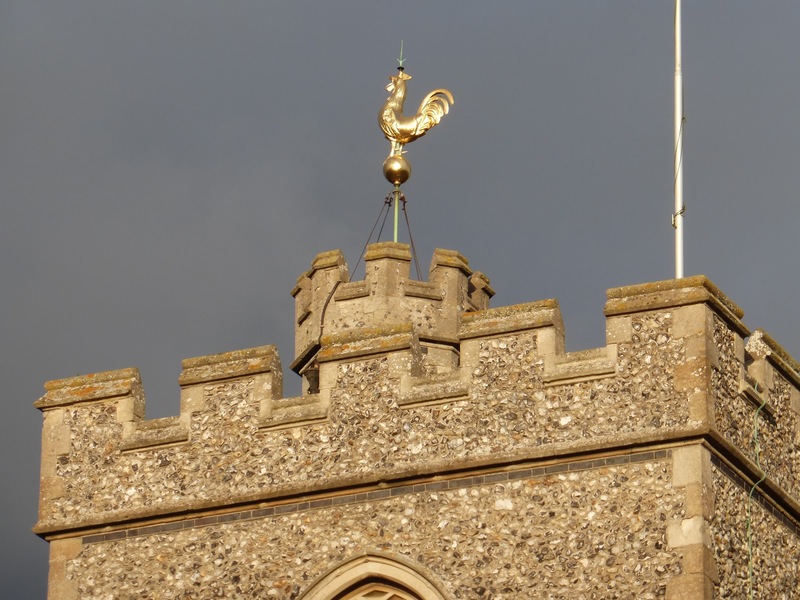 It's moving to stand in what must be one of the oldest rooms in Hertfordshire, though the vestry paraphernalia doesn't contribute to the historic atmosphere. 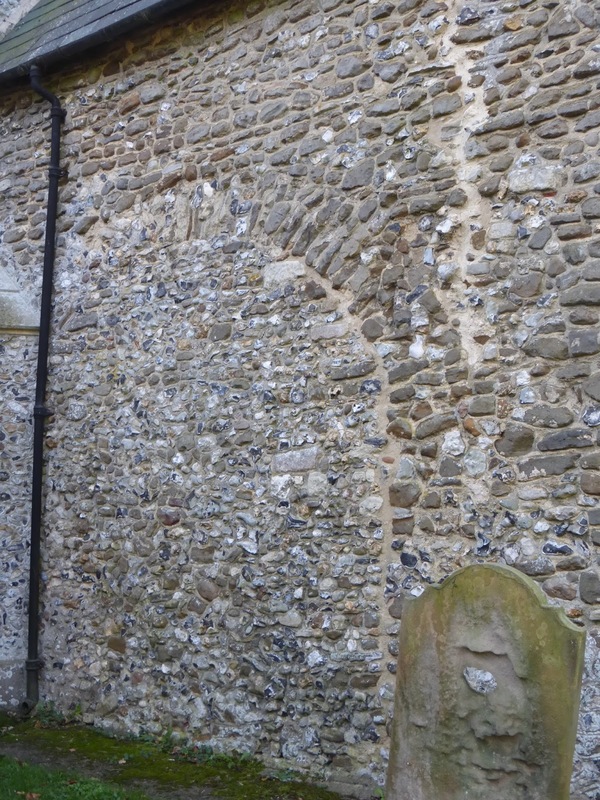 The walls are thick, the Normans taking a better-safe-than-sorry approach to building. 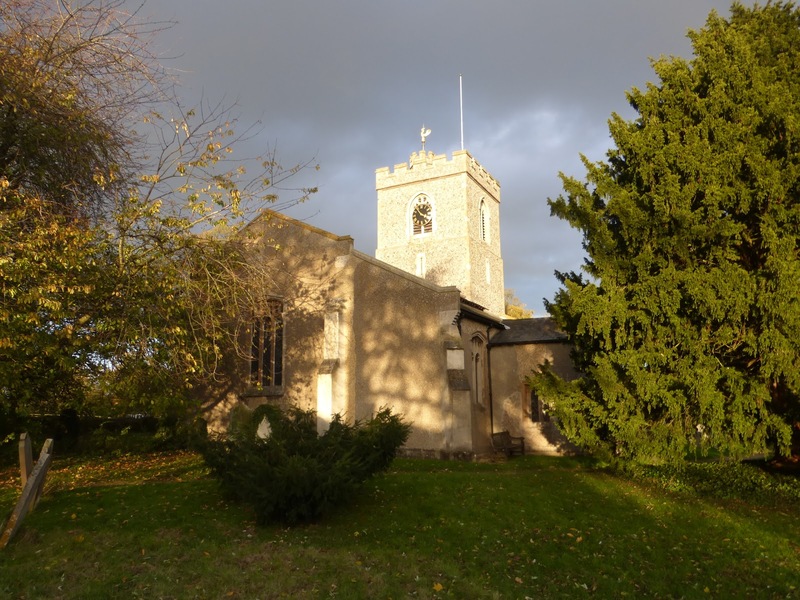 In 1840 Thomas Smith*** (1798-1875), who had already built or rebuilt the vicarage in 1838, was appointed to rebuild the chancel. 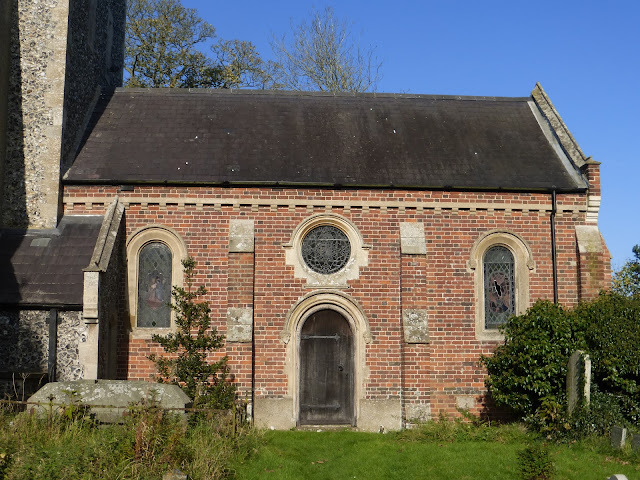 It was decided to do so in the Norman style, to match the surviving crossing and transept (and the existing chancel, presumably). 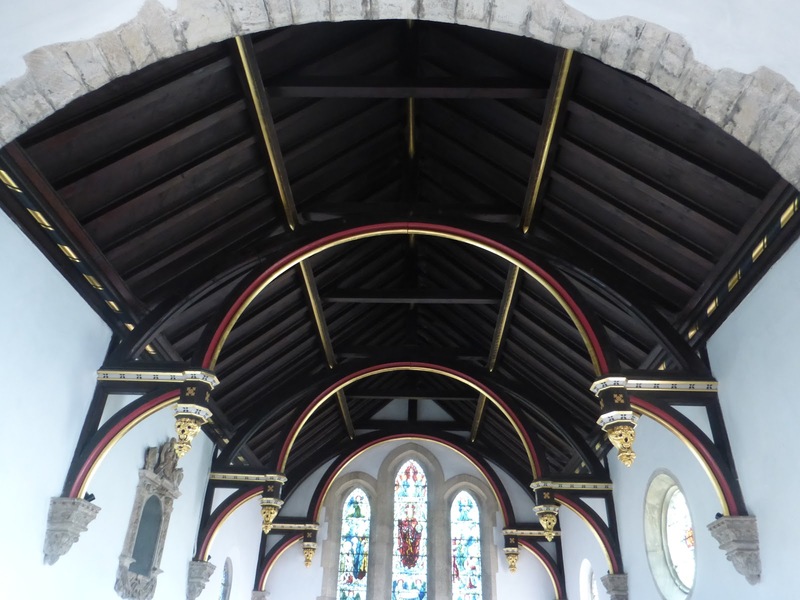 Pevsner can't even bring himself to mention the chancel's roof, which is an anachronistic hammerbeam construction, rather in the style of those in early Renaissance halls. 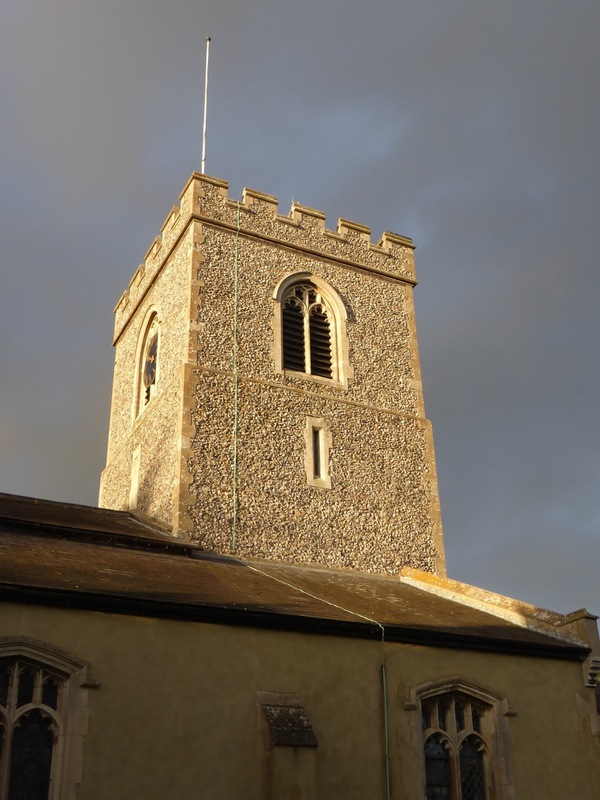 (The Normans didn't use hammerbeams; the earliest examples date from the late 13th century.) I can't believe that such a structure was strictly necessary as the space to be bridged is not very wide at all, but Smith just fancied a bit of architectural bravura. and it looks absolutely splendid. With details, including the (again, structurally superfluous) pendants, picked out in gilt, it must have been very expensive. Hurrah for the confidence and courage of the early Victorians who commissioned, designed, built and paid for it. The exterior has some characterful label stops. 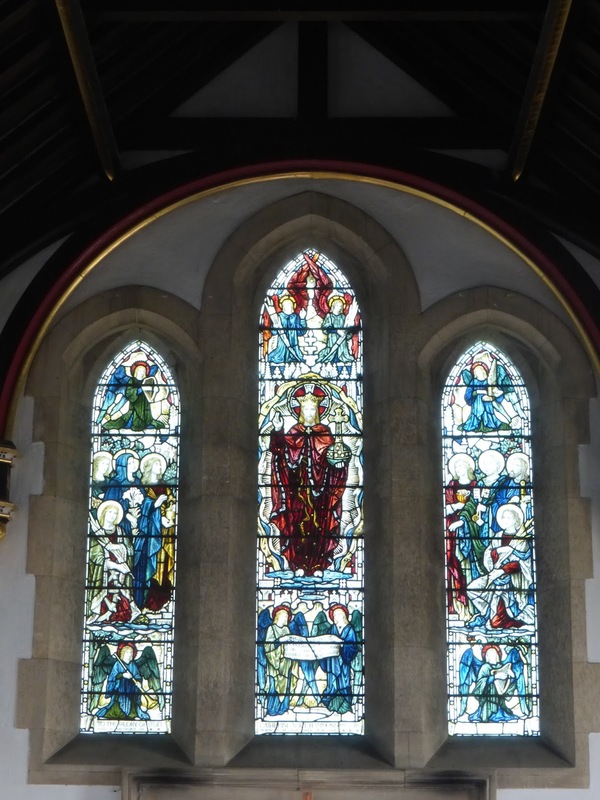 While we're discussing the chancel, it's worth looking at its stained glass. It's all made by the firm James Powell and Sons (which worked from 1834 until 1980, firstly off Fleet Street in central London, and from 1923 in Wealdstone, on the north west fringes of the capital). The names of the individual designers have mostly not been recorded, however, (though perhaps they could be discovered by ploughing through the firm's archives in the Museum of London and the V & A). The east window (set in an Early English style triplet of lancets rather than Neo-Norman windows) dates from 1902, and depicts the Adoration of the Ascended Christ. 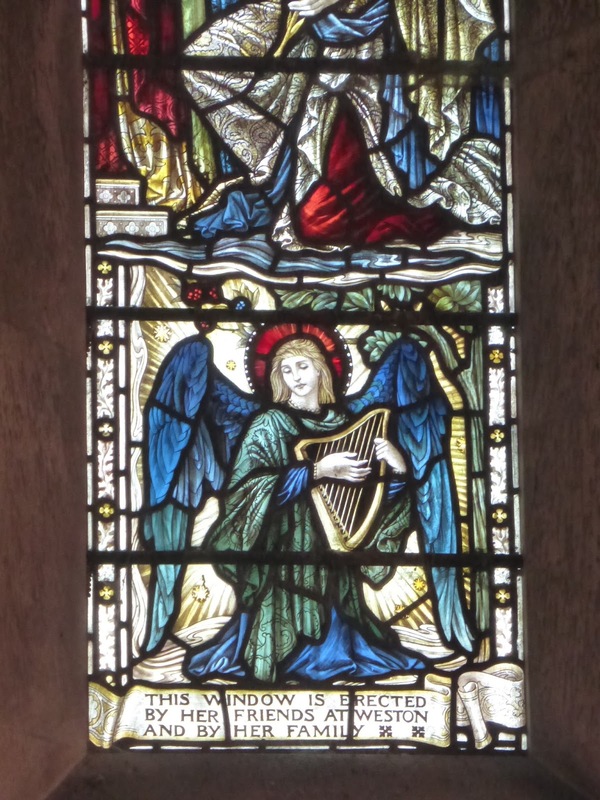 In the late Victorian and Edwardian periods stained glass companies often produced real stinkers, but fortunately this window is rather good. 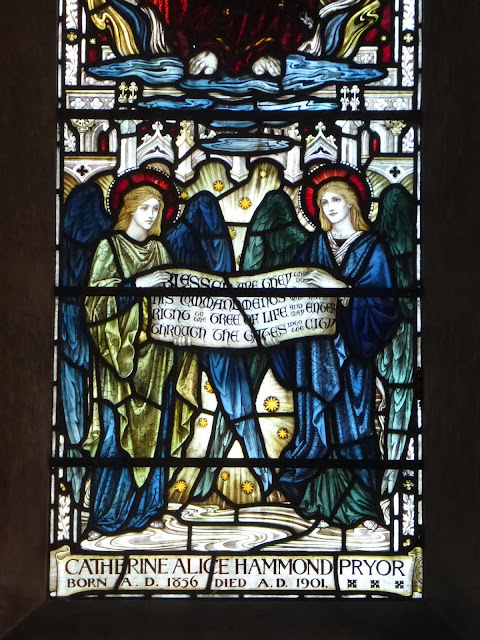 It shows the influence of the Arts and Crafts movement. 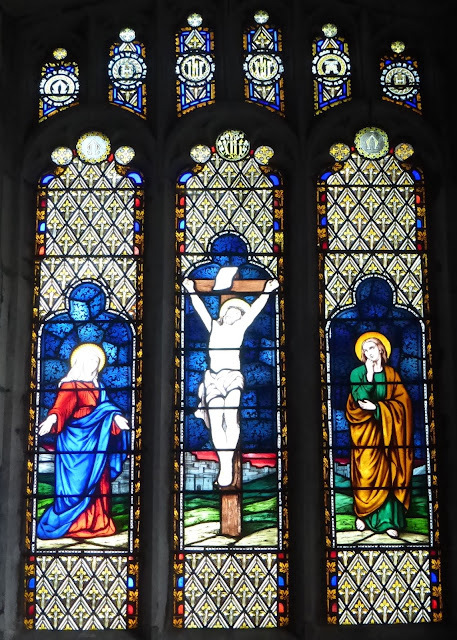 Most of the other chancel windows date from almost half a century earlier, 1856, and are in a completely different style. 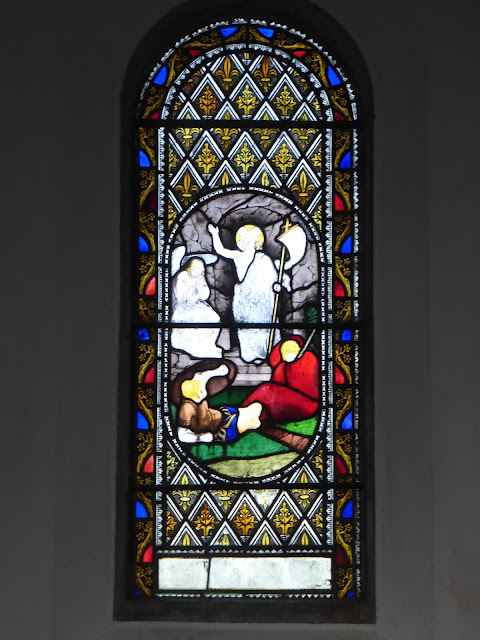 This one shows the Resurrection. It could have been made 20 or 30 years earlier; it consists of what's essentially a realist painting on an oval glass panel, making very little concession to the medium. Powell's glass-firing technique evidently left a lot to be desired at this time, as much of the paint has faded to nothing, while the east window is excellently preserved. The only window in the church that can be assigned to an individual designer is at the east end of the south aisle (which has subsumed the original Norman south transept). 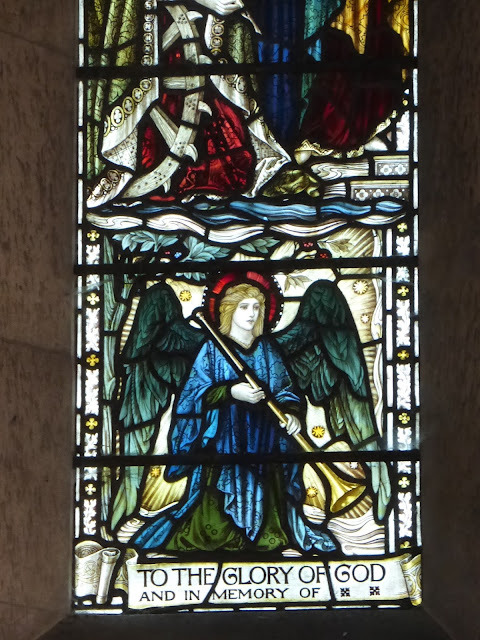 It's by Augustus Jules Bouvier (c.1825-81), and like the chancel windows dates from 1856 and was made by Powell's. 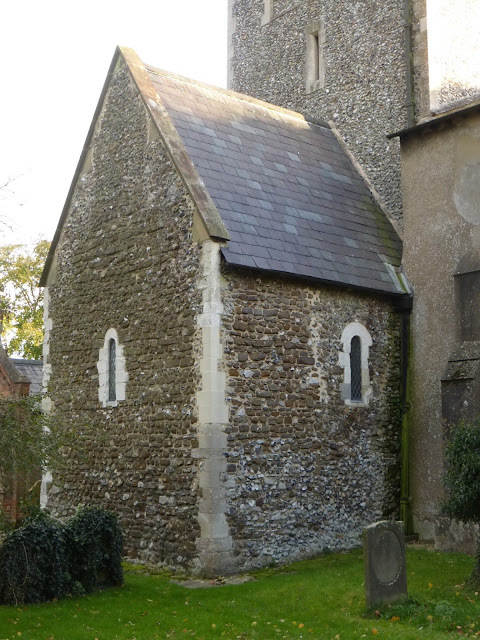 The quarries (the diamond shaped small panes) are the same as in the chancel, but otherwise the style is different: note the stylised background, for example. 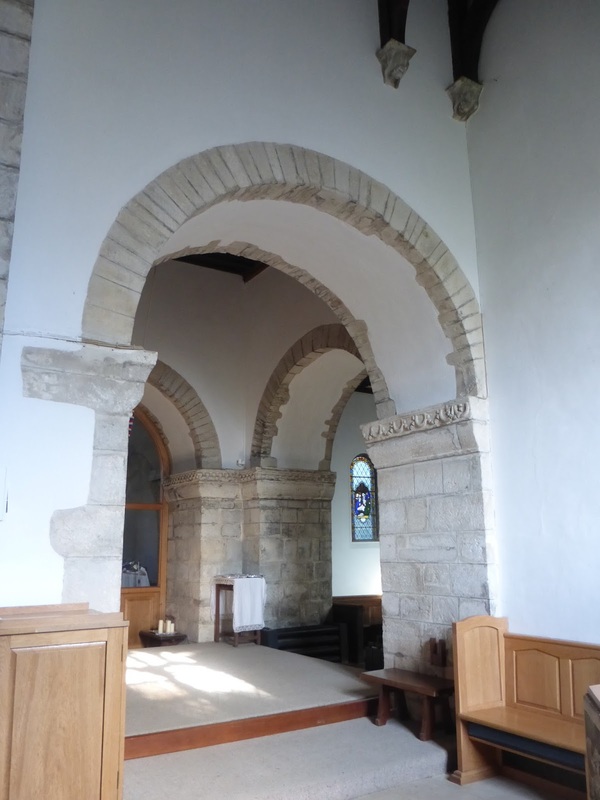 The Norman crossing and transept are undoubtedly the architectural highlight of the church, but, on a different scale, there's a lot more to see. 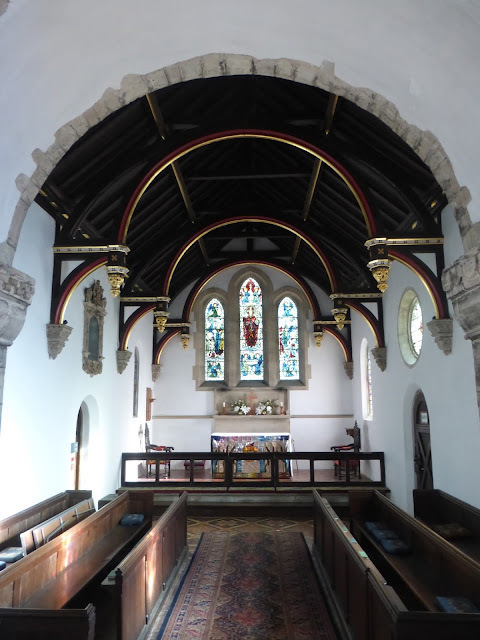 The nave and aisle contain an exceptionally good collection of grotesque corbels, 29 of them in all, mostly 15th century but with some high quality Victorian ones among them. 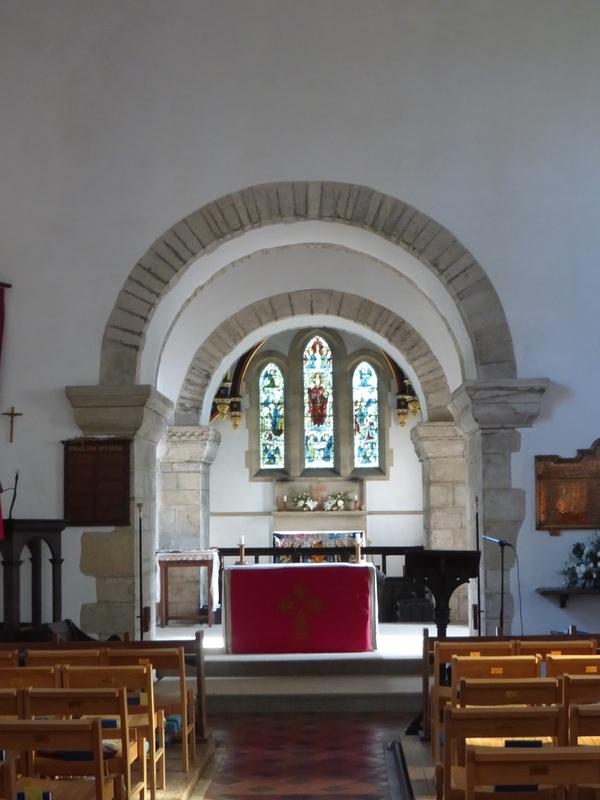 Those in the nave are all 15th century; they're shown here starting from the north west corner and going round clockwise. A figure with hunched shoulders, and hands together as if in prayer. A figure with a finger in his mouth, as if suffering from toothache, or perhaps a half-hearted mouth-puller (see the fourth corbel in the aisle). A dumpy figure who has the appearance of straining to look out of a window to see something he finds shocking. A figure wearing a crown, but otherwise of unregal appearance. He (or she) sticks his tongue out rudely and makes an unusual gesture with his hands. A much more kingly king, though again he seems to have seen something perturbing. This figure seems toothless, and shrinks from something in horror or disgust. One of his arms starts at his shoulder, but the other sprouts from somewhere near his ear. He seems to be shouting. This figure has a forked beard, and has his hand to his chin as if he's contemplating his next move in a game of chess. Another king, looking serious and steadfast. Another startled figure, with a beard. A semi-comic, semi-sinister figure. He seems to be pulling his hoodie away from his face, perhaps to shout an insult across the nave. A rather benign figure with his hand pointing to his throat. 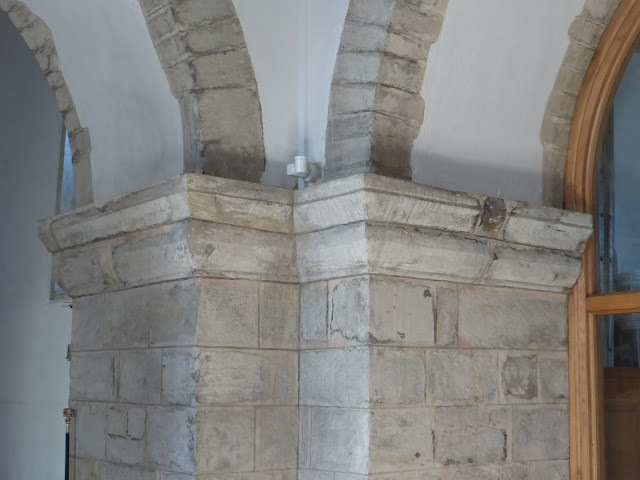 Like a previous figure, his arm, presumably because of the constraints of shape of the corbel, emerges from not where you'd expect it to; his elbow appears to be sunk into the wall. A very serious and intent man, perhaps moustached, supporting his chin on his hand. He has eyes like marbles. 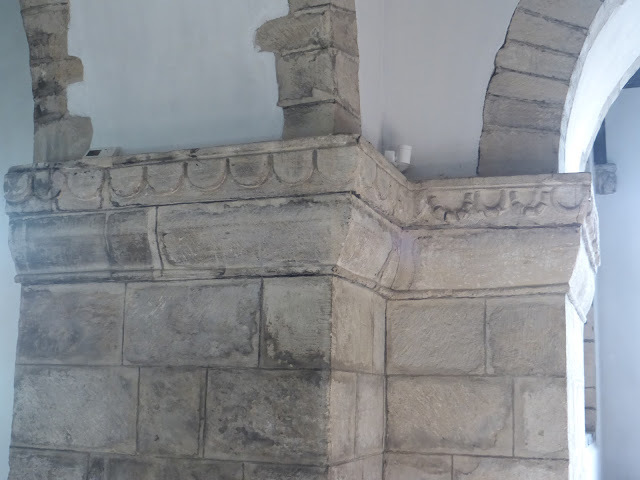 It's possible that this corbel is Victorian. 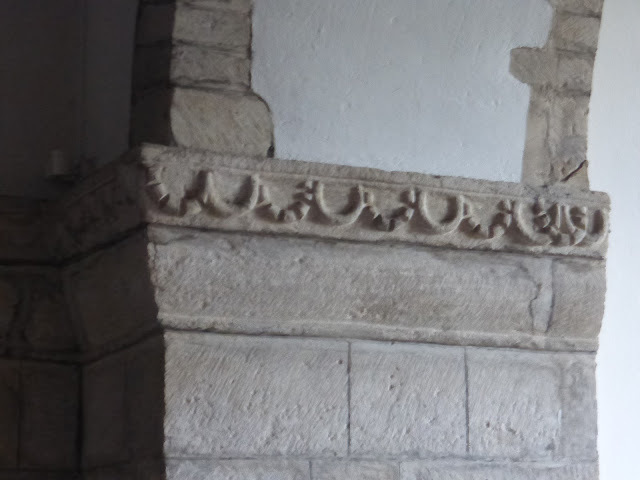 Below are the corbels in the south aisle, again starting in the north west corner and going clockwise. They're mostly 15th century, but some are Victorian (the different coloured stone and crisper carving being the tell-tale factors). This corbel is worn and damaged, but seems to depict a grimacing baboon-like creature. 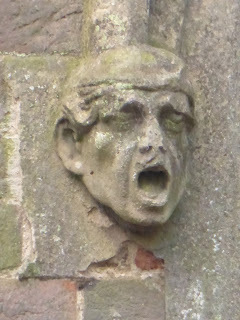 A Victorian corbel of a a man wearing a wreath. 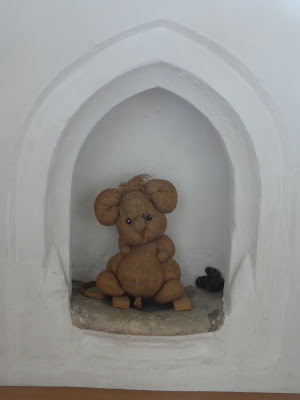 Another Victorian carving of a creature - I can't decide if it's like a cow or a some sort of smaller mammal. 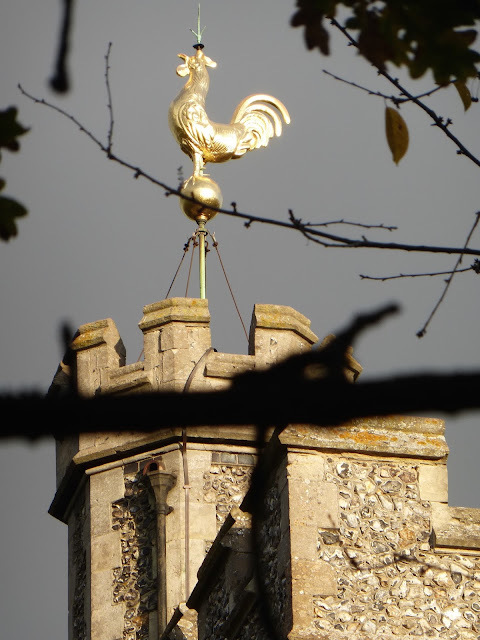 A medieval mouth-puller. 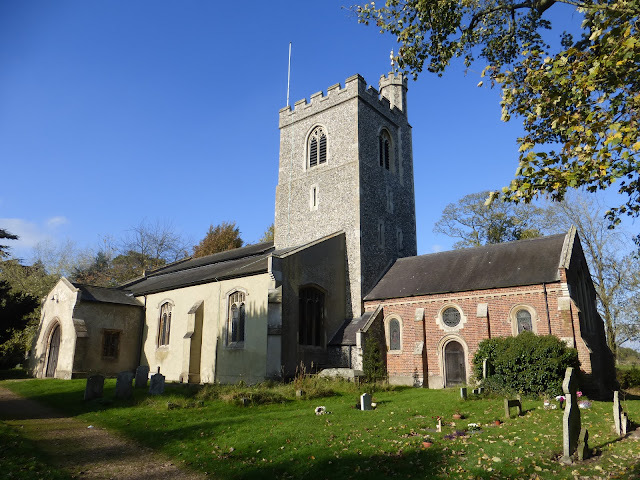 Such figures are surprisingly common in churches (there's one in Finchingfield, Essex, for example), though whether they have a serious significance or are simply meant to be funny we will never know. 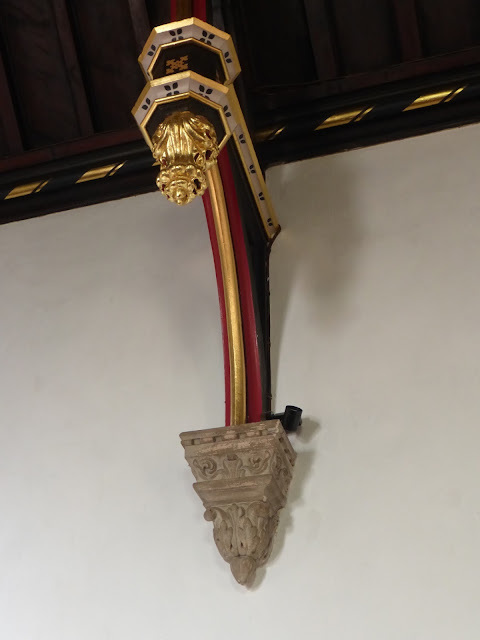 The next corbel also has its hands (or paws) to its mouth. 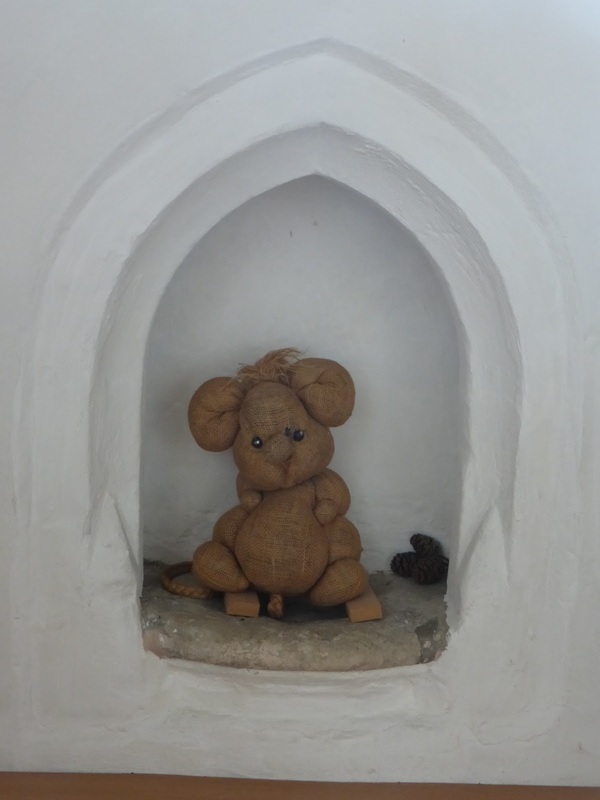 It's a mouse or similar creature, holding and eating a nut. A frog- or toad-like creature with a baleful stare. Another worn carving, but perhaps another frog-like animal. A badly damaged carving; perhaps a heraldic lion. A human-headed creature, perhaps poised to spring, and with a ruff or strangely trimmed beard. 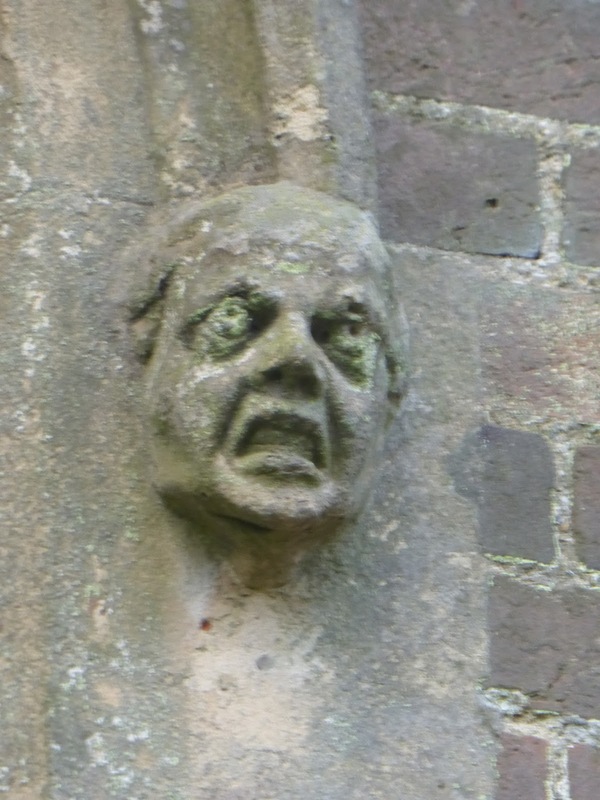 A grimacing figure, not unlike some of the nave corbels. A Victorian man, looking Oscar Wildeish, with his right hand to his face and holding something cylindrical in his left. A Victorian demon, baring his teeth. Definitely not to be confused with the grotesque corbels is the roster of the vicars of Weston. 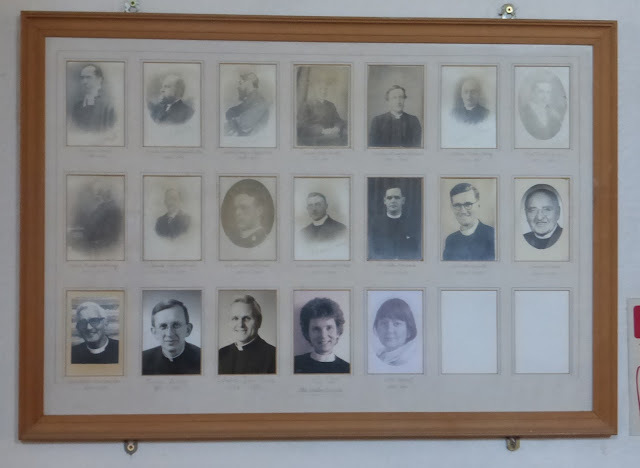 Unusually, and charmingly, this consists of not simply a list of dull names, but of photographs, all the way back to Benjamin Donne (1837-64). Most of the Victorian ones look terribly fearsome. 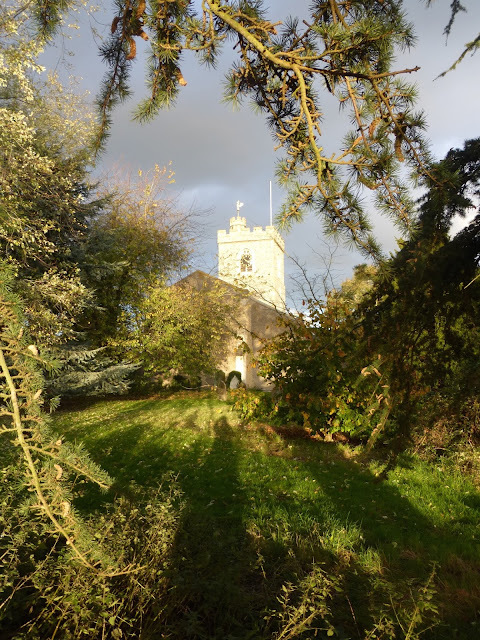 Weston church is very well worth seeking out, despite its attempts to hide itself away. It's generally open (though the outer door of the porch is often shut, though unlocked, and can be stiff - don't be deterred, shove). 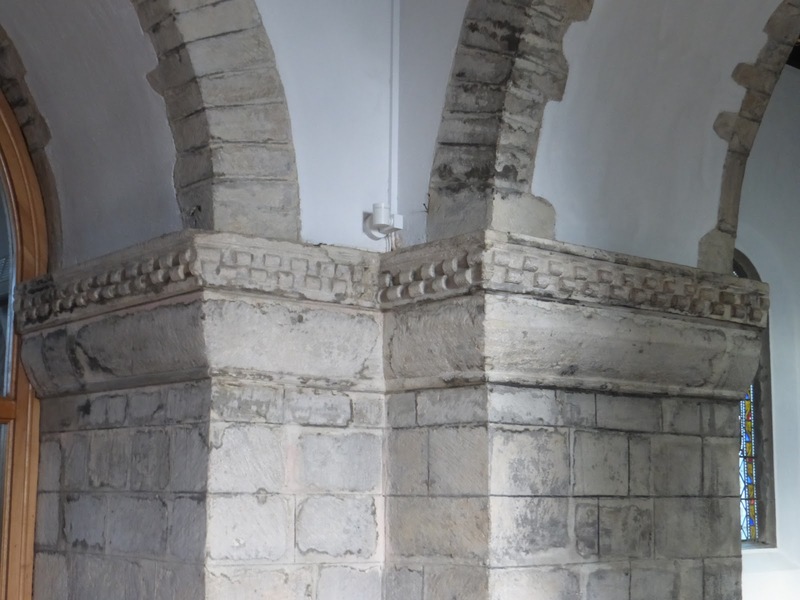 * The other Herts Norman crossings can be found at Anstey, Hemel Hempstead and St Albans cathedral (a spectacular example). ** A Herts Norman apsidal chancel survives at Bengeo.